If you’ve got a kid who can’t help but break out into show tunes or dance numbers at random moments, or if you think you could, you’re in luck. Because coming up are three opportunities to introduce kids to the magic of live musical theater. Why does each new opera director wind up locked in the cellars at the Paris Opera, or as a nervous wreck, or worse? And why does the superstitious opera company blame every missing costume or broken bassoon on a mysterious shadow? The Phantom of the Opera is a ghost story that has captured the American imagination for years. Remember the Scooby Doo episode loosely based on it? And now a new theater version, especially for young audiences ages 4+, is being performed by adult actors at Sugar Loaf Performing Arts Center. It’s toured the country, playing to over a million families and school children, earning praise for its positive message and memorable score. Catch Opening Night on Friday, March 27th, when you can dress up for a red carpet celebration and enjoy a cookie reception with the cast after the show. The show’s composer and writer might even be there. 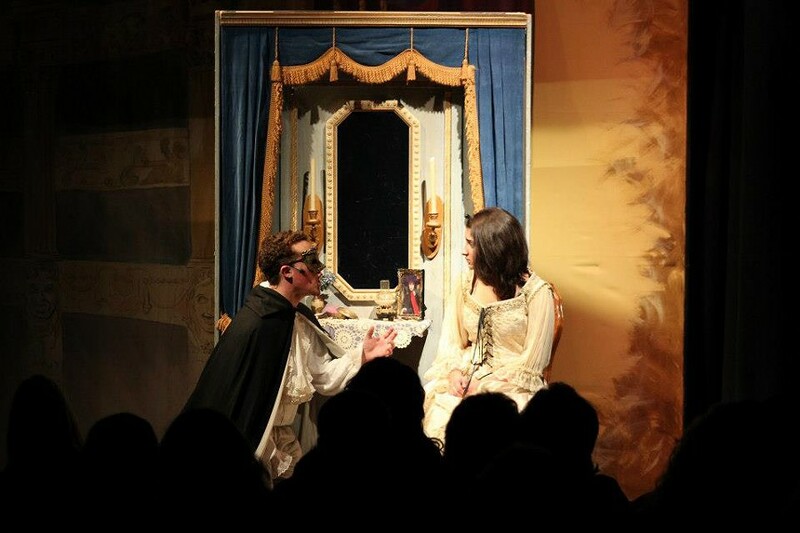 The Details: The Phantom of the Opera at Sugar Loaf Performing Arts Center, March 27-29 with shows at 6:30p and 2p, $15 children, $20 adults. Run-time is 70 minutes with no intermission. Concessions and changing tables available. Call the box office at 845-610-5900 or purchase tickets online or in person at the box office from 10a-4p, Tuesday-Friday. School performances with study guide available. For high quality musical theater performed by children, Coleman High School is the off-Broadway theater. Now showing Mary Poppins, the classic story of a magical nanny, it’s the 45th show directed by Lise Landis Hopson, the teacher who put Coleman’s musical theater programs on the map. Starring seniors Lily Page as Mary Poppins and Thomas Netter as the irrepressible chimney sweep Bert. Both are experienced actors at Coleman and beyond. Lily has professional credits in film and regional theatre, and Thomas is currently directing Kingston Catholic School’s production of The Sound of Music, to be performed this May 15-17. With high-tech lighting and sound, and committed professionalism from the forty-student cast, Mary Poppins promises to be spectacular. There will be flying! The Details: Mary Poppins the Broadway Musical, Coleman High School in Kingston, March 20, 21, 27 at 7:30p, March 22 at 3p, and March 28 at both 2p and 7:30p, $11 children, $16 adults. Run-time is about 2 ½ hours with intermission. Concessions available. Reserve tickets at 845-338-2750, or buy them at the door. Help your budding Broadway star develop the chops s/he needs. Half Moon Theatre School of the Arts in Poughkeepsie is offering an auditioning workshop for ages 12+ taught by award-winning Broadway actress Denise Summerford. Whether it’s an audition for the school play, a community theatre production, or the professional stage, students will be well prepared to face any audition challenge and build confidence to do their best. As a veteran actor who is constantly auditioning and a former casting director, Summerford knows what it takes to land the role. “I teach audition master classes all over the country to college students because they don't get that in their curriculum. It's sadly the last thing young actors think about, but it’s really your full time job as an actor. You audition more than you work, so you have to have a system that works.” Half Moon Theater School of the Arts offers many theater classes throughout the year, and Half Moon Theater showcases brilliant performances by Summerford and others, so check them out. “Getting the Part” will be offered on May 12th and 19th only from 5-7p. Workshop registration fee is $150. All levels of experience welcome. Register online.